Artist Robert Gregory before the war. In January 1915 Robert Gregory confessed to his wife Margaret that he was having an affair. She was devastated. She had considered herself happily married to Robert for seven years. They had met as art students at the Slade School of Fine Art, London. They had three children, Catherine, Anne and Richard. As artists they shared a carefree Bohemian life between Coole Park, the family’s holiday home at Mount Vernon on Clare’s ‘flaggy shore’, and trips to London and Paris. Robert’s mother, Lady Augusta, loved having her grandchildren living with her. ‘In her safe benevolent care’ they thrived while allowing their parents freedom to roam. Nora was 23-year-old Nora Summers, who along with her husband Gerald was part of a circle of painters who lived a carefree life of art and lovers, and knew both Robert and Margaret while students at the Slade. Nora came from a wealthy engineering family. Like the Gregorys, they shared an attractive home in Chelsea, London, and were often in each other’s company. Nora’s striking good looks and modernist dress sense made her an attractive model, and in demand with such artists as Augustus John, John Henry Lamb and Walter Russell. While a student at the Slade she too had met her husband Gerald Summers, and enjoyed a prolonged honeymoon in Italy. They spent the summer of 1914 in a caravan hauled by a large white horse wandering through Dorset. Somewhere, between the Summerses coming and going, she and Robert met again, and fell in love. Robert Gregory was his mother, and late father’s, only child, the golden boy. All their hopes as the future owner of Coole were placed on his shoulders. Not surprisingly as a young man Robert did not show much interest in the running of the estate, other than its availability for his amusement. As a teenager he formed a cricket team among estate tenants and employees. He was an accomplished fast bowler, who later played for Phoenix Cricket Club in Dublin, and for Ireland taking eight wickets in an Irish Scottish international in 1912. As a student at one of England’s top boarding schools, Harrow, he boxed. Later he represented his Oxford College in boxing. He was a brilliant horseman, and fearlessly rode with the Blazers, where ‘few kept his pace’. He shared his mother’s passion for the theatre and the arts. He began to design sets and costumes for some of her plays at the Abbey Theatre, the theatre she co-founded in December 1904. Even though he would quarrel with WB Yeats later, he was involved in set design for several of Yeats’ early experimental plays. There was some kind of reconciliation between Margaret and Nora. Robert must have persuaded Margaret that everything would be allright, and that they could all carry on as the friends they once were. The two couples met for dinner in London, and Margaret, in a valiant effort to be fair, ‘practically persuaded the Summers to come to Coole’. They arrived June 28 1915 staying for three nights, and getting on so well with their hosts - ‘Perfect guests!’ Margaret recorded, that the foursome moved together to the Gregory’s Mount Vernon, on the ‘Flaggy Shore’ rather than having the Summerses stay in a nearby bungalow they had rented. But the group’s amity ‘explosively punctured two weeks later’ following, what Margaret describes as, a ‘disgusting ..scene’ with Robert and Nora on July 16. The Summerses unceremoniously left Mount Vernon, and any permanent reconciliation between Margaret and Robert quickly began to unravel. Next week: Differences between Margaret and Robert deepen, leading to Robert’s departure. NOTES: *All Margaret’s diary quotes, and the general story, are taken from ‘Yeats’s Perfect man’, The Dublin Review 26/06/2015, by Professor James Pethica, Williams College USA, official biographer of Lady A Gregory. **Patrick Maume, Dictionary of Irish Biography. ‘My country is Kiltartan Cross’. To mark the centenary of the death, in January 1918, in WWI, of Robert Gregory, only son of Sir William & Lady Augusta Gregory, of Coole Park, the Kiltartan Gregory Museum, at Kiltartan Cross, will throw open its doors to visitors on Saturday January 20th. and Sunday, January 21st. from 11 am to 3 pm. 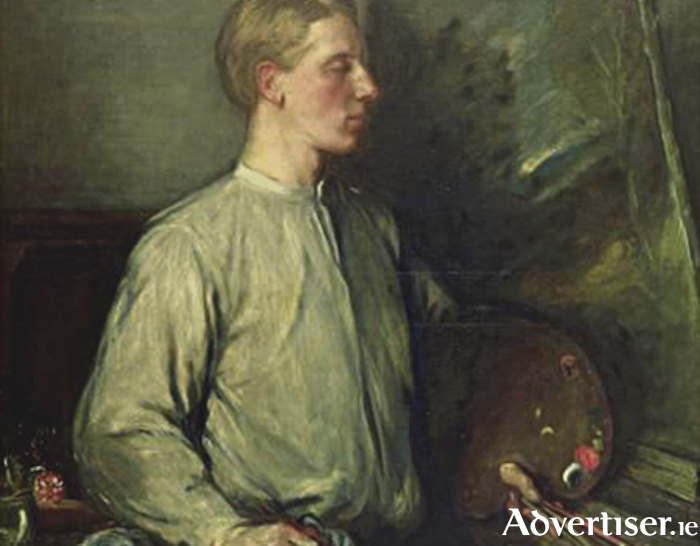 Hear stories about Robert Gregory’s life, view some of his original paintings and see a model of the type of plane he was flying when he crashed over Italy 100 years ago. Groups, individuals and families are all welcome. The Kiltartan Gregory Museum is only a few minutes off the M17/M18 and The Wild Atlantic Way. While Europe prepares for war, Galway dances the Lindy Hop!